Like many kids, one-year-and-half old Zhong Minhan loves yo-yo. At 2:28 pm of May 12, she was awakened from her afternoon nap, promptly got up and sat down at bed enjoying the two-minute swing with smiles. And even now, she does not know that the yo-yo has claimed thousands of lives in many cities, towns and villages of her home province Sichuan. But she does know that she could not see her father Zhong Ying easily during the past two weeks as he has always been at the frontline handing out food, medicines and even worked as a guide for journalists. Zhong, aged 28, is part of the influx of volunteers extending their helping hands to those parents who lost their kids and students who lost their parents to the quake, the aftershocks, landslides and floods of quake lakes. With him as a guide, our China Daily reporting team reached several devastated towns in high mountains, sometimes by foot, walking on broken railways and twisted bridges and finally had talks with survivors escaping from their homes in the dense forests. Zhong is not only a guide for our photographer and me. He was so warm-hearted that every time we came back from Deyang, our car would be filled with water, food, clothes gathered by him from his relatives or friends. I could not agree with him more. Indeed, I promised to myself since the earthquake that I would work by reporting and also voluntarily joining in aid delivery efforts for the people there, especially for those kids and the old in the high mountains. 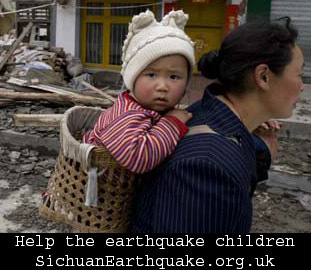 To achieve this, my friends in the UK and other countries have set up a website http://sichuanearthquake.org.uk/, calling for online donation. And we are now designing programs to spend the money donated and anyone’s input and suggestions are extremely valuable. Like Zhong, many, many volunteers and friends moved me deeply. For the past two weeks, my email boxes and mobile phones are filled with warm greetings and applications to adopt children or financially support them. The message from one of my colleagues read: “I am determined to support two kids for their education and living expenses and my husband and I will work as their parents.” She asked me to help her achieve this. So far, I have got about 10 messages like this. I will help them make their love reach those in need. My friend in the BBC, Alex Kirby, aged 67, and his wife had discussed with me in March how to help the Chinese poor during their stay in China. The second day after the quake, he wrote to me saying “he feels sad” and wanted to do what he can. All these healing words and actions always inspired me to reach the poor and the hard-hit people who are still living in extremely harsh conditions. Now, as Zhong and friends in Sichuan did, I would fill my car’s rear with necessities and hand them out to my interviewees if they need them. And last Thursday and Friday, the skilled driver Zeng Xiaohong drove me to Qingchuan and Pingwu, which were located in high-rising steep mountains. Slight tremors occurred frequently, though the survivors have already been used to aftershocks and tremors. What was worse was that long stretches of landslides have cut the main road off and Pingwu has been isolated by the broken road. Finally we made it, though we feared that blowing the horn of the car might cause sand and stones to fall down from scarred mountains. We conquered our fears and there we found that people badly in need of tents, medicines and other necessities. Healing the trauma of those who have lost their loved ones, rebuilding homes for those millions of people and creating education and job opportunities for them are daunting challenges in the long run. To battle these challenges after burying the dead, we need to pray for more love and voluntary contribution. This entry was posted on Tuesday, May 27th, 2008 at 11:10 am	and is filed under News, Stories. You can follow any responses to this entry through the RSS 2.0 feed. You can leave a response, or trackback from your own site. You & your friends may help those helpless commoners trapped in China more by forcing the following Qs to PRC. *Why the newer schools collapsed worse than the older private structures? Kickbacks taken again?! *Why most of the govt. officials’ kids studying abroad full-time with no jobs drive expensive cars to schools? Where the money came from? *Do those well-fed old men in Beijing really think that PRC will be a first-class strong nation soon while the common practice of taking kickbacks/bribery go on as usual? More lives may be saved in the future if you can find those answers for them. Wow, I had been lucky to find this site after i was looking for some info on Bing! Keep up the great work! i90005 which is certainly set to end up being priced at around $229 - $249. I do not know whether it’s just me or if perhaps everyone else experiencing problems with your site. screen. Can somebody else please comment and let me know if this is happening to them too? предназначенная для начинающих создателей веб ресурсов! It’s really a great as well as useful item of details.. brazil visa requirements I am just pleased for you to contributed this useful information and facts along with us. Be sure to stop us well informed similar to this. Thanks for discussing. предоставляющий информацию на эту же тему?!! !